Are you interested in discovering other cultures around the world while pursuing your undergraduate studies? Thanks to Towson University’s study abroad programs, it’s entirely possible! If you are not sure which program fits you best, the study abroad office has an online search tool on their website. You can search based on program types, length of study, cost, and destination. You may be wondering, “What can I study overseas?” The good news is you can study any course offered in your major, minor, electives or even General Education credits. 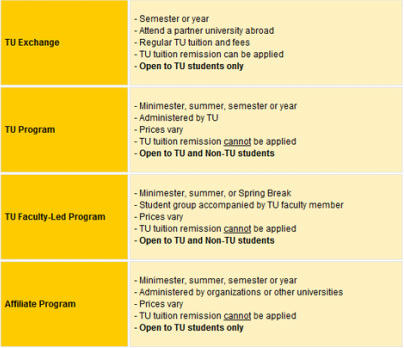 All of the credits taken overseas will be transferred back and counted towards your Towson GPA. Worried about tuition and expenses? Financial aid and scholarships are available for students studying abroad. Students also can use their financial aid from Towson to pay their tuition abroad. When studying abroad, students have the choice to live with a local resident or in a dormitory. All study abroad programs come with housing options for students. To start the planning process, the Towson University Study Abroad Office recommends students to attend an information session and make an appointment with a Study Abroad advisor. Study Abroad applications should be submitted by March or October every year depending on which term you want to go abroad. For more information, you can contact the study abroad Office on the fourth floor of the Psychology Building Call (410) 704-2451 or email studyabroad@towson.edu. They are open from 8:30 a.m. to 5:00 p.m. every Monday to Friday.